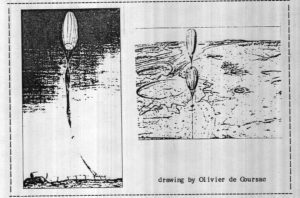 Balloons operating as airborne rovers have been suggested as ideal candidates for early exploration of the Martian surface. An international study team composed of scientists from the U.S.S.R., France, and the U.S.A. is planning the launching in 1994 of a balloon system to fly on Mars. 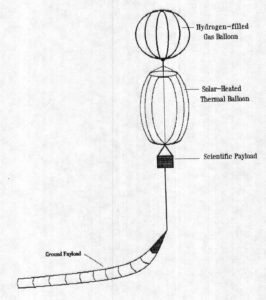 The current likely design is a dual thermal/gas balloon that consists of a gas balloon suspended above a solar-heated thermal balloon. At night, the thermal balloon provides no lift, and the balloon system drifts just above the Martian surface; the lift of the gas balloon is just sufficient to prevent the science payload from hitting the ground. During the day, the balloon system flies at an altitude of 4 to 5 kilometers, rising due to the added lift provided by the thermal balloon. Data from the NASA/Ames Global Circulation Model (GCM) indicate that over the course of a single Martian day, there may be winds in several directions, and in fact it can be expected that there will be winds simultaneously in different directions at different altitudes. Therefore, a balloon system capable of controlling its own altitude, via an autonomous flight control system, can take advantage of these different winds to control its direction, thereby greatly increasing both its mission utility and its longevity. 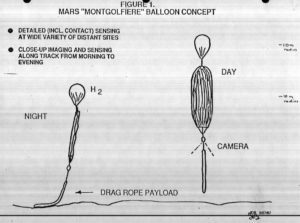 Once autonomous balloon control has been demonstrated in the 1994 mission, ever more complex balloon missions could follow, at each Mars launch opportunity, paving the way for a Mars sample return mission near the end of the century, and later, for manned exploration of Mars. This paper describes the trade-offs and issues involved in the balloon-autonomy concept, investigates the benefits to the mission of various levels of autonomy, and describes concepts under consideration and the current program plan. The authors conclude that a goal-driven autonomous control system for the Mars balloon can be constructed, and that the use of such a control system would increase the effectiveness of the scientific return, the safety of the balloon system, and the duration of its mission on Mars. 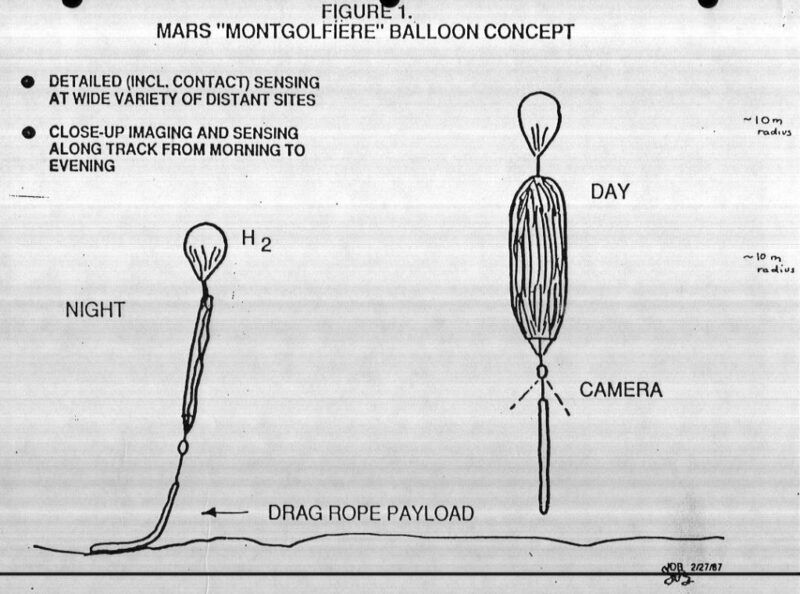 A balloon provides an effective platform for Mars surface exploration in that it is potentially long-lasting, and can travel many miles over its lifetime. The balloon mission complements the rover, in that that latter carries a much larger science payload over a shorter trajectory, whereas the balloon can explore a much larger area with a smaller payload. Together they will collect science data that cannot be observed by Mars orbiters. 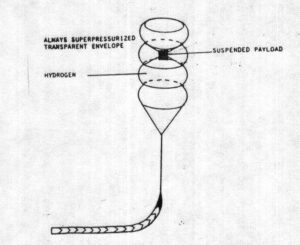 The international study team (the U.S.S.R., France, and the U.S.A.) is presently analyzing four balloon designs, including a dual thermal/gas balloon, a single superpressurized balloon, a classic (i.e., ambient pressure) gas balloon, and a kite balloon (Figure 1). 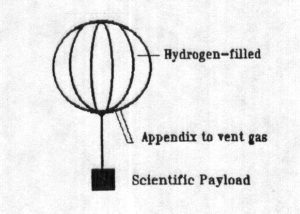 The concepts of autonomy discussed here are applicable to all balloon designs; the most likely candidate from among these four designs is the dual thermal/gas concept, which will be assumed for the purposes of this paper. 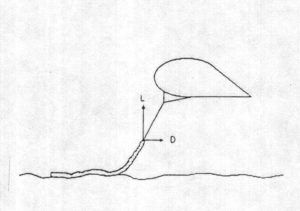 While the balloon system is flying, using combined gas and thermal lift, the horizontal component of its movement is dependent on wind direction and velocity. Data from the NASA/Ames Global Circulation Model (GCM) indicate that over the course of a single Martian day, there may be winds in several directions, and in fact it can be expected that there will be winds simultaneously in different directions at different altitudes [PolJ87]. Therefore, a balloon system capable of controlling its own altitude, via an autonomous flight control system, can take advantage of these different winds to control its direction, thereby greatly increasing both its mission utility and its longevity. 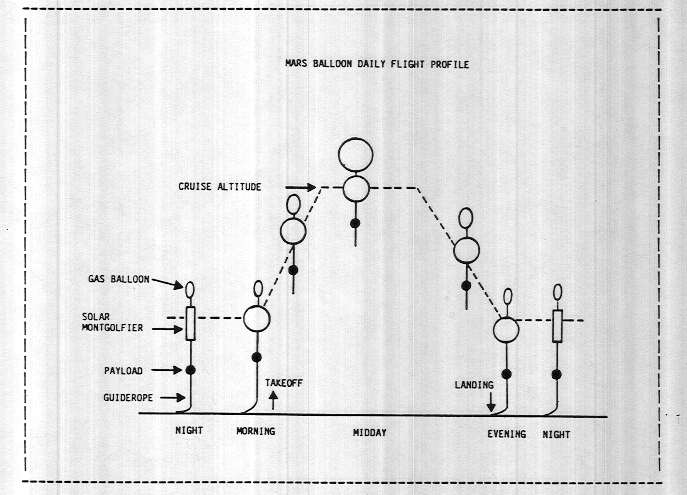 Whereas the simple daily ascent to ceiling altitude of the proposed balloon design will provide an interesting science return, a navigable balloon system could be programmed to achieve a broad range of additional missions, such as documentation of candidate landing sites, collection of documented samples and their return to a common area, and visits to areas of special interest as a result of other observations (such as those from the Mars Observer, etc.). 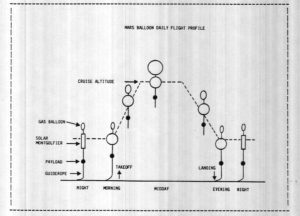 Devising an autonomous flight control system for the dual thermal/gas Mars Balloon would greatly enhance the balloon system’s scientific return. 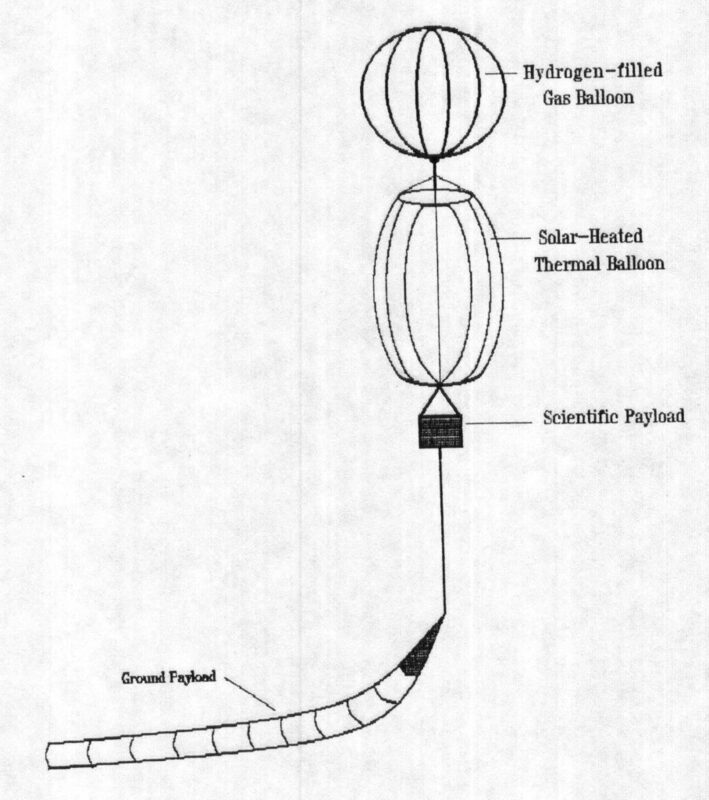 The dual thermal/gas balloon design consists of two balloons, one gas-filled, the other a solar-heated thermal balloon. The closed gas balloon is suspended above the solar-heated thermal balloon (Figure 2). At night, the thermal balloon provides no lift, and the balloon system drifts over the Martian surface; the lift of the gas balloon is intended to be just sufficient to prevent the science payload from hitting the ground. The ground-sampling portions of the science payload instruments can be operational during this time (Figure 3) [FriRC87]. At sunrise, the thermal balloon is heated by sunlight, complementing the lift of the hydrogen-filled balloon, and causing the entire vehicle to rise to its float altitude, where it cruises all day. In the afternoon, as the sun begins to set, the thermal balloon cools, thereby losing its lift; the balloon vehicle drifts down to the surface, where it again moves along the surface on its ground payload. The gas balloon still prevents the science payload from being damaged by hitting the ground. (Figure 4). Morning liftoff prior to excessive soloar heating, to avoid buffeting by thermals, etc., which results from taking off when the atmosphere is hot. Such buffeting could pose a danger to the integrity of the thin balloon envelope. Note that there is a high level of uncertainty concerning actual Martian wind and weather conditions. Stable ascent and float at ceiling altitude. Initiation of descent after thermals have cooled, but before the air is so cool that the balloon system crashes. Compensation for deterioration in thermal balloon envelope (i.e., resulting from buffeting over time). Compensation for gas leakage from gas balloon. The descent and ballast issues are of particular interest. As the sun sets, the balloon starts to descend from its cruising altitude of 4 to 5 kilometers. 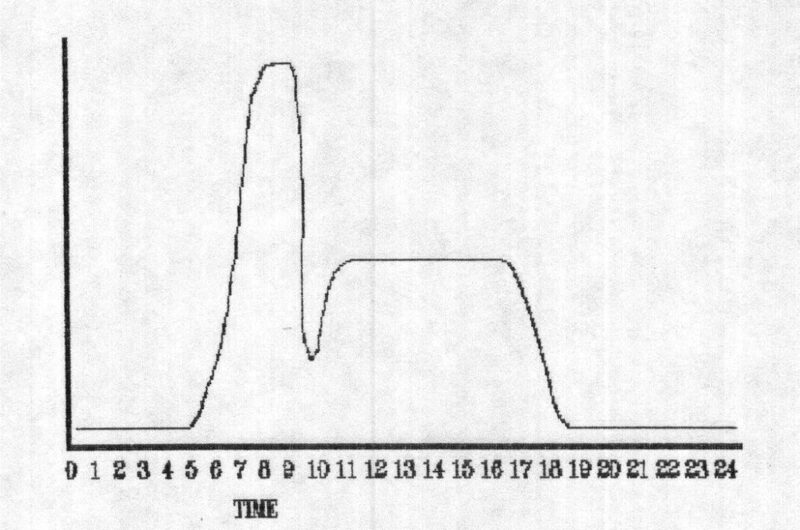 With time the descent rate tends to increase due to two effects: reduced solar elevation provides less solar heat; and forced convection cooling of the descending solar-heated balloon reduces its lift. 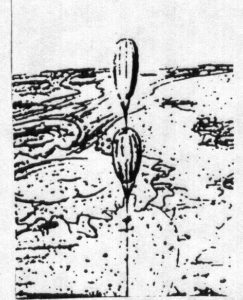 If unchecked, the result is an approximately 5 meter/second descent rate culminating in the crash of the balloon onto the surface. To avoid this disaster a design is needed that starts the descent early enough in the afternoon to assure sufficient solar input all the way down, and which prevents a “runaway descent” by keeping descent velocity at less than 1 meter/second. This could be accomplished either by a clever design of a “dumb” system that has no active control, or by various levels of active control. The tradeoffs of these alternatives are under discussion. Another control issue involves the use of ballast to compensate for gas losses in the gas balloon, and for losses in the efficiency of the thermal balloon due to degradation of the envelope film. The decision of when to deploy ballast, and how much is to be deployed, must be made efficiently — either in a balloon-borne controller or from Earth. If on the balloon, it requires appropriate devices; if on Earth, it requires extensive two-way communications. Modifying dwell-time at a landing site. Managing the limited budget of power, data storage/processing, communications times, system lifetime. Such actions may increase in sighting opportunities, increase the accuracy or interest of the measurements, and prolong the life of the science payload. The use of the autonomous controller to manage the flight trajectory is particularly interesting. At morning liftoff the balloon will perform an ascent to cruise altitude that would allow the measurement of the wind profile. This profile will have a validity interval of several hours, during which time the trajectory can be influenced by the proper choice of altitude profile. An interesting issue is the degree of autonomous control that should be resident in the balloon, and how much in a large earth-based computer having a wind model of Mars, how much reliance on in situ measurements and how much on model-based predictions. The value of controlling the trajectory is clearly to improve the science return by going towards interesting areas, and to protect the balloon by avoiding treacherous terrain that could either be hit in the daytime, or cause system damage during guide-rope traverse at night. The issue of autonomous control must be viewed in the context of a series of ever-more complex balloon flights, occurring roughly every two years, for the long-term exploration of Mars. At each step, increasing levels of autonomous control may be appropriate in order to achieve mission goals. Due to the low density of the atmosphere of Mars (approximately 10 grams/meter3 at the surface), the mass of the balloon system must be kept as small as possible. One must carefully assess the impact on the over-all scientific mission of the balloon system of any additional sub-system, such as the autonomous controller. The current design achieves a science payload of 20 kilograms out of a total system mass of 70 kilograms; to achieve even this level of science-to-mass efficiency, the balloon “skin” must be only 3.5 microns thick [HeiTF88]. In the previous sections, we have briefly described some of the mission benefits that could be realized through the use of an autonomous control system. The principle “cost” or “down-side” is the additional mass that must be added to the system; much of that will have to take the form of a displacement of science payload. A clever design will, however, use sensors that have a science return, and a processing system that can be shared by the science payload. These data can be obtained by a combination of on-board sensing and external input. The impact of on-board sensing on system weight may be severe unless highly-sophisticated sensing/processing is done to minimize weight and power. 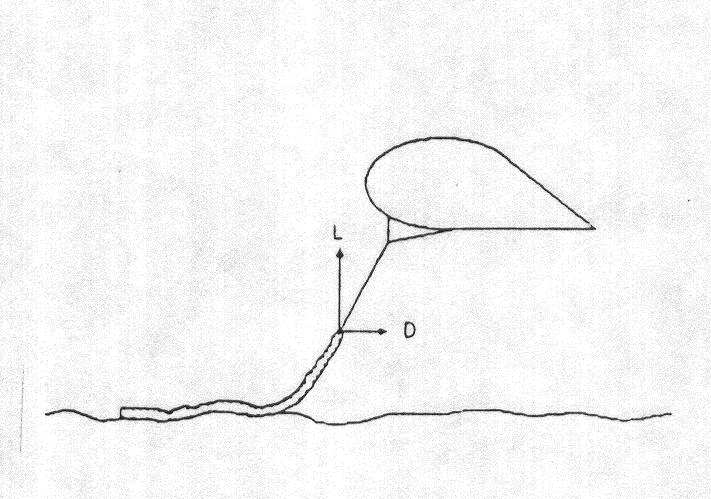 The implementation of control is typically done by two types of actions: (1) irreversible jettisoning of ballast (perhaps in the form of 200-gram science modules that fall to the surface as long-term meteorological stations); and (2) reversible modifications of the thermal efficiency of the thermal balloon by either venting internal hot air, or changing the thermal characteristics of the side facing the sun. The management of the ballast drop is relatively easy, but the thermal control of the hot-air balloon may require careful design. 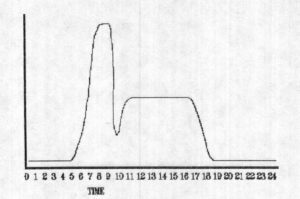 The 3.5 micron film cannot stand much manipulation. 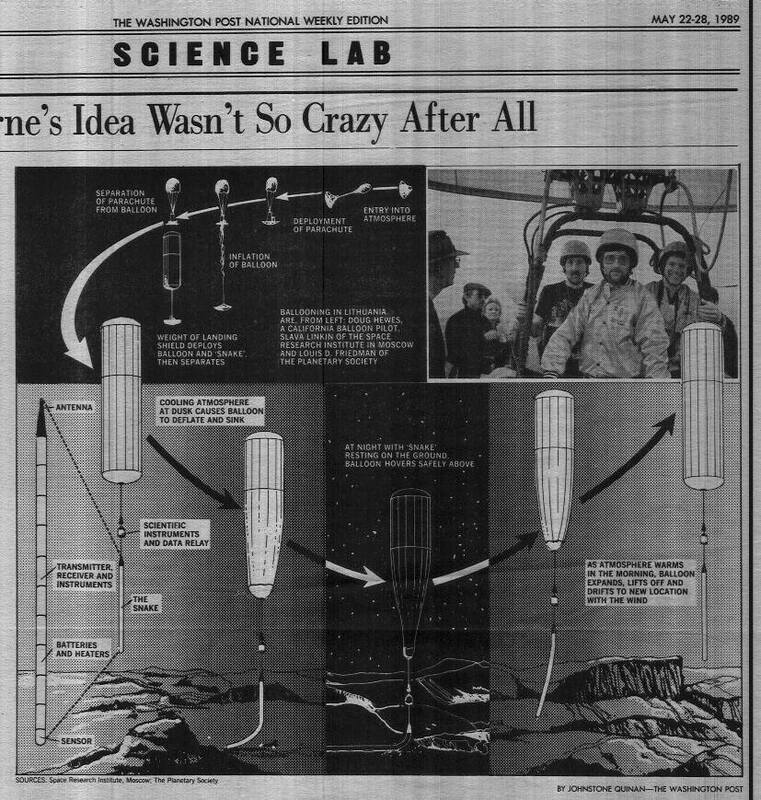 One concept under discussion uses a thermal balloon having different films (clear, aluminized, or gold-plated) at various locations around the balloon, and a control system that rotates the balloon with respect to the sun to achieve the desired thermal input. Such a system of controlling ascent/descent velocities is being designed. The dual thermal/gas balloon can be used for a variety of missions having an increasingly complex level of engineering sophistication and scientific return. The simplest mission (i.e., no autonomous controller) makes diurnal ascent/descent, carrying sensors such as a vibration sensor and vibration spectrum analyzer in its ground payload to monitor ground mechanical properties during nocturnal ground traverse, an array of atmospheric sensors measuring temperature, turbulence, dust size and concentration, and additional sensing [BlaJ86]. A more complex balloon might have a valve in the thermal envelope to allow controllable altitude profiles during the day. After an initial ascent in the morning (as indicated in Figure 5) to determine current local wind patterns, the controller then uses the valve in the thermal bag to select an altitude for the day’s flight. This could be extended to incorporate numerous diurnal ascent/descent profiles as well as low altitude (terrain-following) missions with the aid of a small radar altimeter to permit high-quality ground imaging using a CCD camera. 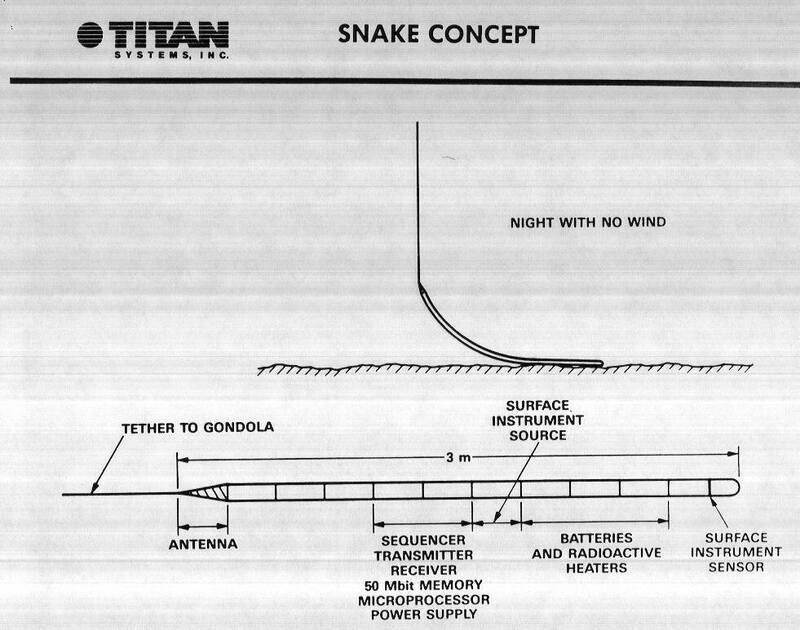 A still more elaborate concept uses an intelligent balloon with an on-board array of sensors and computers that allow it to optimize the science return, by intelligently controlling its vertical and horizontal profile. This could include the dropping of portions of the ground payload mass in the form of small ground monitoring stations, or the collection of ground samples from desirable locations for balloon transport to an area having easy access by a subsequent rover. The “elephant graveyard” mission, in which several balloons are sent on widely separated sample collection missions bringing samples to a central site for later retrieval, is an example of the potential use of such sophisticated balloon systems. A minimal Mars balloon autonomous control system would consist of a computer processor and storage devices (ROM for programs, RAM for sensor readings and computational products), wind direction and velocity sensors, a controller and actuator to open and close a valve of the thermal balloon envelope, and inter-connections and interfaces between the computer processor, the sensors, the power source, and the controller/actuator. Without any significant increase in weight, inter-connections could be added between some portions of the science payload and the autonomous controller’s computer processor. With the corresponding additions to the controller’s software, payload effectiveness could be increased through the mechanisms described in Section 3.1. Investigations are underway to determine the cost-benefit trade-offs of additional sensors. This paper described the benefit, trade-offs, and issues involved in the balloon-autonomy concept, investigated the mission pay-offs of various levels of autonomy, and described concepts under consideration. The authors conclude that a goal-driven autonomous control system for the Mars balloon can be constructed, and that the use of such a control system would increase the effectiveness of the balloon system, both by providing an improved science return and by increasing the level of safety. 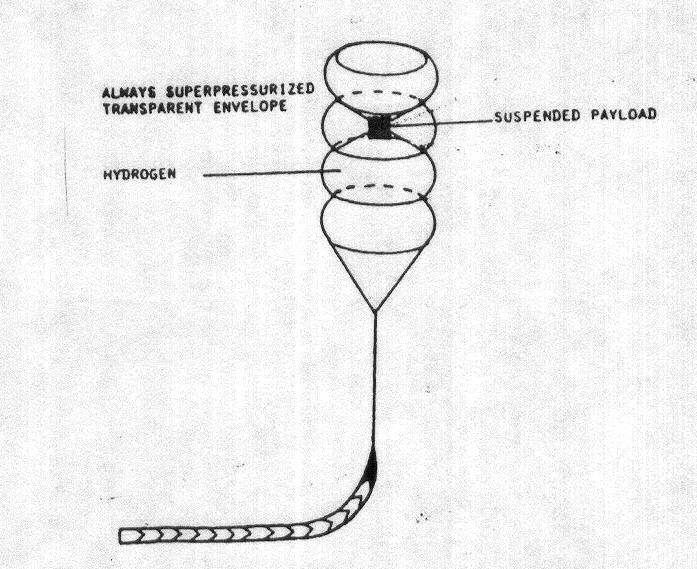 Construction of trial balloons out of thin film. The French Space Agency (CNES) has successfully flown a 1/10-volume scale-model of the Mars thermal balloon, proving that it can be built, deployed, and inflated (at 30 kilometers above the Earth), and that thermal performance is as expected. Smaller scale models have been provided by CNES to JPL for tests in a ground environment. Guide-rope experiments. JPL and Cal Tech are currently working on a second-generation “snake”-type guide-rope, to be tested in the California desert. Sensors and data recorders will be attached to record speed and surface roughness. 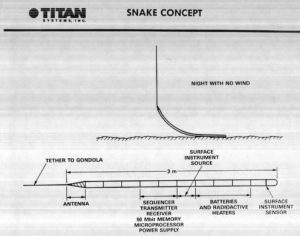 There has been some discussion of the possibility of using the flexibility of the snake as a means for determining the size of boulders on Mars, and thus determining suitability of prospective sites for use as prospective landing platforms for other vehicles and missions. Balloon-flight dynamics experiments. 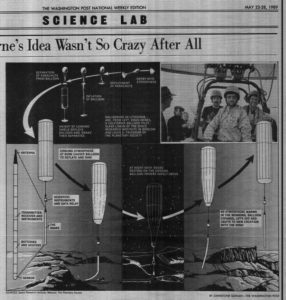 TITAN Systems and the Soviet Space Research Institute (IKI) have been conducting balloon-flight dynamics experiments in the Soviet Union, under the sponsorship of The Planetary Society, a California-based organization that promotes space exploration. Planning of autonomous design concepts. TITAN and others are proposing and analyzing various AI and knowledge-based techniques for providing the autonomous control function.